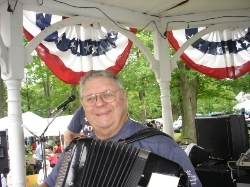 Fred smiles as he plays his Excelsior during FPB's final tune of the day on August 2, 2008 in Vernon Center, NY. 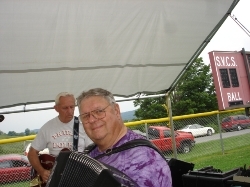 Tom, Fred, Fritz, George (blocked by beam) and Gabe are pictured here during FPB's gig at Old Home Day in Vernon Center, NY on August 2, 2008. 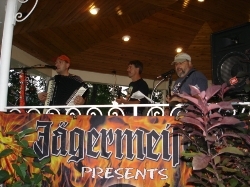 Fritz, Frank, and Gabe are pictured here during FPB's second set on July 31st at the Village Park in Camden, NY. 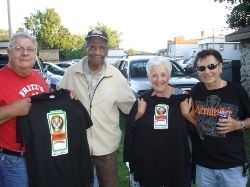 Fred and George present Jager shirts to their friends, Jerry (L) and Roz (R) during intermission on July 31, 2008 in Camden, NY. 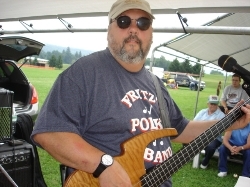 Years ago, George was in the band 3 Dudes and a Doll, along with Jerry and Roz. 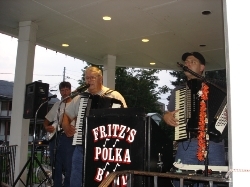 Frank, Fred, and Fritz are pictured here during FPB's second set in Whitesboro, NY on July 30, 2008. 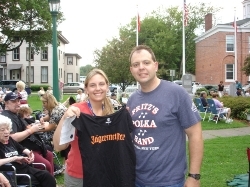 Fritz presents a Jager stretchy shirt to a new FPB fan on July 30th during intermission. Gabe with his Parker on July 30th in Whitesboro, NY. 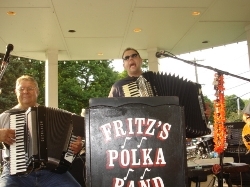 Fred and Fritz with their Excelsiors on July 30, 2008 at the Village Park in Whitesboro, NY. 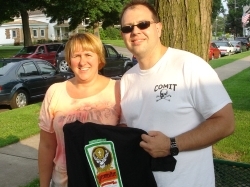 On July 30th, in Whitesboro, NY, Fritz (wearing a Central Oklahoma Metro Interdiction Team shirt, courtesy of his friend, Ron) presents a FPB/Jagermeister t-shirt to his friend, Michelle. Fritz and Michelle attended school together "a few years ago." 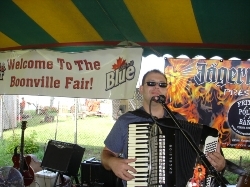 Fritz with his Excelsior on July 27, 2008 in Boonville, NY at the Oneida County Fair. 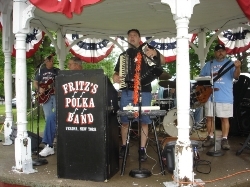 Fritz, Rick, Gabe, and Tom are pictured here during FPB's second set on July 27th at the Oneida County Fair in Boonville, NY. 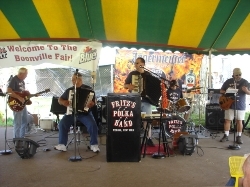 Rick and Gabe are shown here during FPB's gig on July 27th in Boonville, NY. 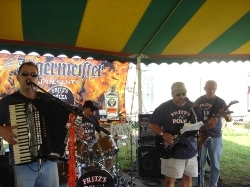 Tom, Fred, Fritz, Rick, and Gabe tear through a tune during FPB's first set on July 27, 2008 at the Oneida County Fair in Boonville, NY. 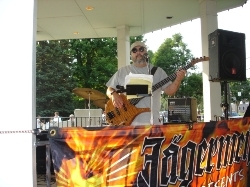 Gabe (modeling the new FPB 30th anniversary t-shirt) is shown here during FPB's gig on July 26, 2008. 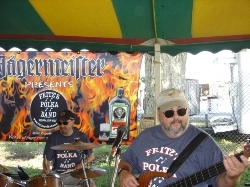 Tom and Fred are pictured here during FPB's gig at the Stockbridge Community Fair on July 26, 2008 in Munnsville, NY.